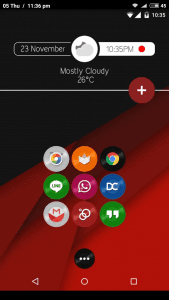 If you are getting bored of having the same wallpaper and style of icons then you can change the default wallpapers of your smartphone as the ability to personalize mobile devices is incredibly important to the users. Nowadays, in this fast growing world, no one will ever satisfy by the limited wallpapers, themes etc. There is a wide range of developers which created or developed a lot of android icon packs for the Android users. So, choosing the right one for your smartphone will be a difficult task for you. That’s why we’ve decided to reduce your hassle by providing a list of 15 best free android icon packs to customize Android. You have to install a launcher first to access the icon packs. 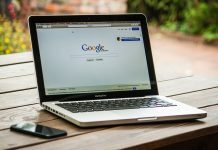 Just, go through the following article so that you can get an idea about the android icon packs. 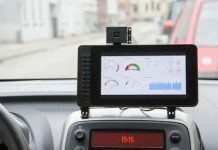 The Ikon is developed by BladeX Designs and contains more than 1300 icons. Whereas, the developer team adds more icons regularly. The pack features a lot of variety and basically, it focuses on simplicity. 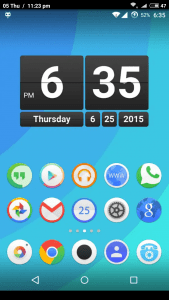 Moreover, the icon pack consists of many colorful wallpapers. It has support for Unicon and can be used with Nova Launcher, Go, Holo, ADW, Apex Launcher, Action, etc. 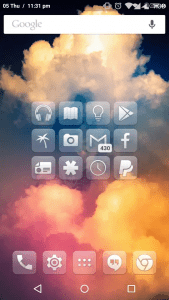 One of the premium icon pack, Quadra is created by Ryconography. The pack is full of square icons having colored borders. Though the pack is still available in Beta version, it is still a good option as it has over 500 icons.If you have a smartphone which runs on an android 5 Lollipop operating system, you can use it. 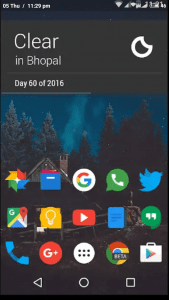 The pack has its own dashboard app and it works with Atom, Nova Launcher, ADW, Action Launcher, Holo, Unicon (root needed), Apex Launcher and Smart Launcher. If you are looking for an icon pack which is ideal for pastel wallpapers and vintage style themes, then you can use Bleach. It comes with over than 1000 icons, light color backgrounds and sharp symbols. Moreover, it also features 20 wallpapers which help to enhance its classy looks. 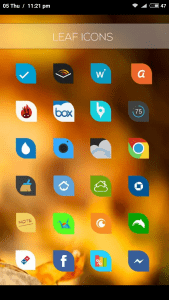 The icon pack supports Go, Apex Launcher, Smart Launcher, Aviate and other options. The CandyCons is one of the best icon packs that have the amazing and unique set of icons which help it to stand out from the crowd. It consists more than 600 options and each icon has alternatives. To switch them you have to just hold down the alternative icon and select its alternative from the popup dialogue. 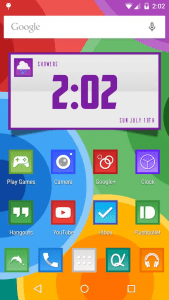 It supports over 20 launches and some of them are Epic Launcher, Go, Apex Launcher, ADW, etc. Created by Tomy Cadus, Adastra has colorful, detailed design and it features approximately 1200 icons in HD quality. The icons are specially designed to suit XXXHDPI screens. Moreover, the smartphone holders who have Gingerbread 2.3 Android version will be able to use the icon pack. 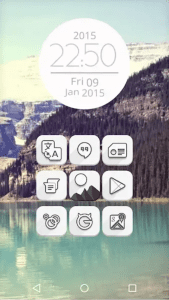 The flat style icon pack, Glim has over 1500 free icons as well as the variety of high-quality wallpapers. Moreover, one will also have the access the 2000 alternative icons if he/she choose the paid version. It supports ADW, Nova Launcher, Epic launcher, KitKat Launcher, Go, Nova Launcher, CyanogenMod Theme Engine, Atom and other options. With more than 800 icons and a combination of color, outlines and shadows, Silhouette is another icon pack that will keep you happy. The icon pack has a dashboard app so that you can request new icons and manage the ones that are present. Those who like the retro style and the music fans and will surely love the VNYL. The pack contains over 2400 round icons. 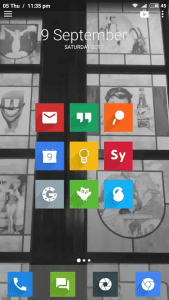 A variety of launchers supported VNYL such as Apex Launcher, Atom, KitKat, Epic Launcher, Solo Launcher, Smart, Nova, etc. The Voxel is another set of icons which has over 1900 square icons having a combination of bright colors and shadows. To get an organized appearance on your home screen, you can go for the icon pack. Moreover, it comes with different types of wallpapers. Nothing looks as great with white themes and wallpapers with a 100% dark icon pack. Stamped Black is one of the premium android icon packs which features more than 1000 icons in two different styles. The icon set is developed by UPpack. Developed by BA Designs, Subtle has more than 1300 options and lots of HD wallpapers. 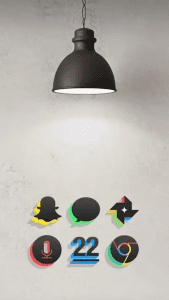 The icons don’t have bright and rich colors. 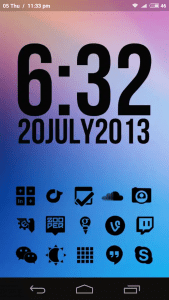 It supports ADW, Apex Launcher and Nova Launcher. If you don’t like round shaped icons, then Glasklart icon pan is just for you. The square icons having a transparent background and gently rounded corners look more appealing to the eyes. More than 1320 icons are available in this set, which is enough to provide happiness. 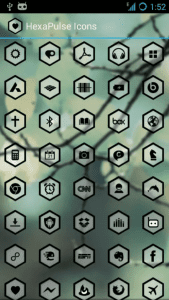 It is small icon pack which consists of more than 200 icons. It is definitely a unique icon pack as all the icons are leaf shaped to give your home screen an original and quirky touch. The Icon pack is simple having only around 150 icons. The icons have a bold contrast between the light background and the dark border. The best features are its hexagonal shape which makes the pack unique from other ones. If you are bored of having a plain home screen, go for the Vit icon packs as the icons definitely attract people by their rounded-corner shape, shadows and level of detail. It consists of 200 icons. Now since I have provided a list of free and great Android icon packs, it’s time to decide which icon packs is best for you and your device. Even the people who are least inclined towards technology use phones throughout the day. And with this much usage at some point we get bored of the same look & feel of the device (like same screen lock and icons). 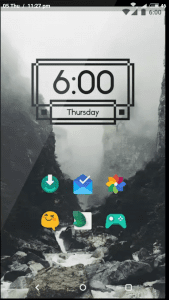 For all these instances, these cool Android icon packs come to play their role and maintain your interest in your mobile as before. 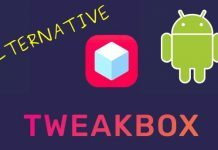 These Android icon packs are capable of transforming your device from fonts to icons, lock screen replacement and almost many other features. So, go on and try these lovely icons & do comment us the one that became your favorite!